S ometimes I think we Mormons aren’t aware of how differently we think from other groups. This can lead to communication problems with “outsiders,” but it can also keep us talking only to ourselves and ingrain ideas in our collective mindset that go unchallenged. When ideas aren’t challenged, they can become distorted and wind up doing us harm. Take for instance, our mindset about boys and, in particular, the Boy Scouts, the sacred cow of Mormon youth programs. At the outset, please understand I’m a fan of scouting. I have two sons; my oldest, an adult now, is an Eagle Scout. My younger son’s leaders are all-around great guys who strive to make the program meaningful. But Mormons do view scouting differently than non-LDS people. To mainstream Americans, Boy Scouts is a classic organization that brings boys together to learn a few things and have some camping adventures. If a kid makes Eagle, he’s got something great to put on a resume or college application. In Mormon culture, however, Boy Scouts has become a measure of a boy’s religious commitment and faith. This approach to scouting stems from thought patterns that I find dangerous to boys. The response talked about how the girls seem to be doing fine, and that we already have programs in place for them. The goal is to create enough worthy priesthood holders to match the number of great women. The letter also asked if I did not want worthy priesthood holders for my daughters to marry. These lines are enough to make the blood of any feminist boil on behalf of daughters everywhere, but notice how his sentiment also demeans boys. Mormons begin their consideration of men from a negative vantage: Girls are fine, but boys need to be made worthy. The result of this perspective is that we overlook girls and clamp down on boys by promoting compliance to the heavily structured, temporal activities in order to upgrade boys from their natural state of “unworthiness” to “worthiness.” This toxic message of inferiority seeps into the souls of our boys. According to the aforementioned stake president’s perspective, I should encourage his participation because scouting will shape him into a “worthy priesthood holder.” But he’s already that. He just doesn’t want to cast onto concrete. At 13, he feels he’s outgrown Scouts. That doesn’t mean he is outgrowing God, or that he is disrespectful of authority (priesthood or otherwise). Yet, if he opts out of scouting, he’ll risk being labeled “less active”and spark the concern of the “active.” That concern often feels like an expectation of spiritual failure, all because he’s not interested in scouting. It’s a rational response for a young man to reject a church that he perceives teaches merit badges on a sash are reflective of a testimony in the heart. The problematic thinking, then, creates the very problem it intends to address. The attitude that boys are naturally spiritually inferior to girls (or men to women) is offensive. My sons, like my daughter, began life as wonderful humans who craved meaningful, spiritually-fulfilling activities. A few weeks back, my starting-life-as-less-than-worthy son helped pack boxes for a Meals on Wheels service project. He came home flying. Happy. Church wasn’t a waste of his time that night. The needs of his soul were met by meeting the needs of others. The link between God and service was something he naturally felt and enjoyed. That these opportunities won’t present themselves every Wednesday is a fact of life youth accept. What my son doesn’t need to accept, however, is any judgement that he is spiritually flawed or less committed to God because he doesn’t enjoy scouting, or that his lack of interest/participation predicts his failure as a spouse or an adult priesthood holder. I’ve no issue with the Church partnering with Boy Scouts, but I reject the tandem ways Mormons, as a cultural body, accept the premise that boys are less “worthy” than girls and then offer as remedy for their alleged spiritual inferiority a strong dose of structured, temporal activities. Yes, faith is the undercurrent of scouting, but faith is also the undercurrent of a Mormon boy’s life without scouting. In the eyes of many boys, scouting adds nothing to their lives but a series of hoops they resent. I believe in our boys–in their fundamental goodness–and I don’t believe yoking them to false measures of faith is a cure to some presumed, inherent spiritual weakness. In fact, it seems such artificial measures are more likely to create spiritual weakness than destroy it. Where we expect spiritual weakness, we will find it; where we seek spiritual strength, we will also find it. When I ask LDS m oms to describe their sons, they use words like sweet, tender, giving, kind, funny, and smart–the same words they use to describe their daughters. If we want to encourage these traits–along with strength, courage, perseverance, commitment, and responsibility–we must adopt a positive pattern of thinking about our children, regardless of gender. My son understands that, when he casts into a parking lot, he’s not going to catch a fish because fish don’t swim in concrete. Likewise, spirituality isn’t in the concrete, but in the Living Water. We can’t judge who my son is, or who he will become, by what he failed to catch under the lights in a parking lot, but rather by his desire to catch something at all. Likewise, our boys shouldn’t be judged by their compliance to a program that, at best, might run parallel to their relationship with their Heavenly Father, but cannot possibly equal the real thing. Are you a current member of The LDS Church? Freedom Wins: What does that have to do with her excellent argument? Whether she is or not, she is right that our current approach to scouting as a ready-made program for “making boys worthy” is flawed, overly expensive, and certainly not fair to all of our youth. Boy Scouts does teach a lot of good principles, but does not necessarily support spiritual growth. What is wrong with beginning that discussion? There are many active members of the church who feel the same way. My question wasn’t necessarily about this particular entry. I have wondered that after reading her other posts. As for scouts, we have two boys who attained Eagle. One of whom, now in the military, jumped up two pay grades based completely on his achieving Eagle Scout. We never relied solely on the program to achieve their full spirituality. It was only a part of a total effort in all areas of development. Anyone finding it ‘overly expensive’ can easily go to their Bishop for assistance. I’m sorry there appears to be those who find it flawed. I’m glad you’ve read other posts on this blog. I’m flummoxed, however, that you can’t see my faith in every one. Faith can manifest in many ways, including in the drive to sometimes say, “Did you ever think about it *this* way?” Thanks for “showing up” here and I hope you keep reading. FTR, this post isn’t about flaws in Boys Scouting. Its about the idea that boys/men are less than girls/women. Fishing and concrete were simply too good of images for this writer to pass up. My older son enjoyed scouting much more than my younger one. Different kids. Different talents. Different likes and needs. Also, Bishops won’t assist with a Friends of Scouting drive. That’s a completely voluntary thing (as opposed to a need or requirement) and, from what I understand of decades of connection with the BSA, none of the money raised goes to fund local troops. Someone has to pay the high dollar men and women who are on the organization payroll. Personally, its never seemed appropriate to me for Friends of Scouting pitches to be made to congregations, but that’s a discussion for another day. All troops are required by BSA to participate in FoS. Stake president members AND bishops absolutely do encourage and sometimes demand members contribute to the BSA. They read letters over the pulpit, do fundraising phone calls and use guilt to make people contribute to the organization. The boys are not require to fundraise themselves, like girls scouts do, and the local troop sees zero dollars of these funds, it all goes to headquarters. To ask ward members to contribute I think is disgusting and fundamentally flawed. I await and pray for the day the church is done with scouts. Life long active member speaking. You betcha. Temple-recommend carrying, prophet-supporting, occasionally pants-wearing regular worshipper of our Savior Jesus Christ. But I do sit in the back row of the chapel every Sunday. This is precisely why I care enough to suggest we rethink the way we too-often cast boys and men as less-than. I hope you judge my argument by its merits and not me by my free expression. Are they going fly fishing for real sometime soon? If so, practicing in a parking lot is how you prevent the day at the river from sucking rocks. If it was just to pass off some merit badge requirement, then the troop is probably pretty sick. The thing about LDS scouting is that it usually isn’t scouting. Scouting means the boys are in charge. They set the activities and they lead. The adults rarely say a word during a real scout activity–they help in the background. The description of your son’s experience makes it sound like he’s in a babysitting program instead I a scouting program, because if he was in a scouting program he would know why he was doing each activity because he would be involved in choosing and running the activities. Good point. For all the complaints about how YW programs are going, the girls aren’t leading. It’s sisters not letting the class presidencies lead. Owen, I’ve no idea what future plans are regarding fishing trips. I rather doubt there is fly fishing planned because here where I live, most fishing is bass fishing. 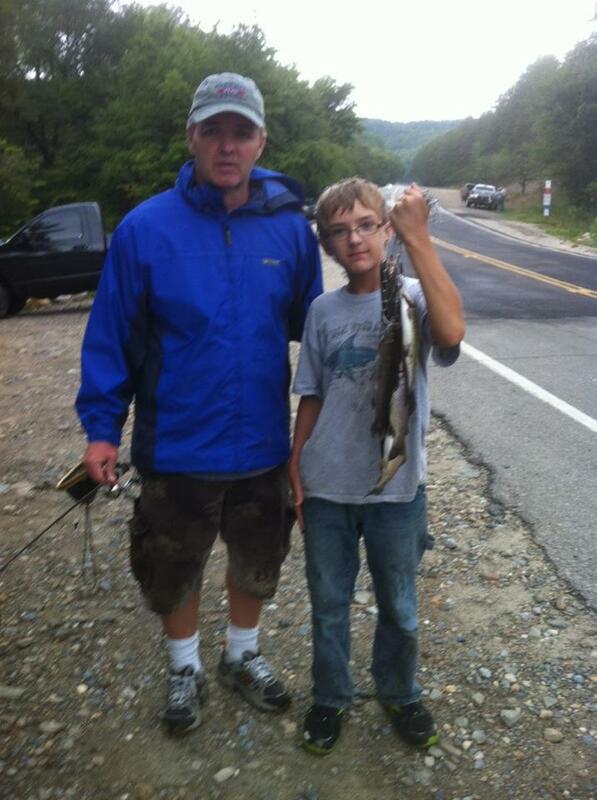 My son is a trout fisherman, but we have a drive to make to get to areas where there are trout. Boys who fish have to learn to cast somewhere and a parking lot is fine if that’s what’s available. As to kids planning activities. Yes, that’s the ideal and that seems to work better for a lot of non-LDS troops. As Janie points out, its supposed to work that way for the YW as well. But I cut leaders a great deal of slack here. I’ve served as a YW president (ages ago) and my hope was always that the girls would drive activity choices. I remember one planning meeting, the Laurel presidency devised an activity near Christmas where they hand-made Christmas cards. I advised against the project because I didn’t think for a minute the girls would actually enjoy this, based on the way other craft projects went. The Laurel president insisted and she and her presidency devised a list of things girls were to provide (some funded by the organization but most not because we had few funds). Needless to say, the activity night rolled around and the presidency didn’t bring their assignments. No one wanted to make Christmas cards. And, of course, the first person to get in my face about how stupid an activity it was was that Laurel president. I quoted her words about the greatness of the idea back to her. She recognized them and walked out of the activity, which was an all-around failure. And that’s fine. The girls choose the activity. It failed. Maybe something was learned by the girls. But most of the Laurels didn’t know their presidency planned that. Sister Downing took heat for a lame activity. This is the point in a leader’s experience –when she knows kids and then parents–are judging her ability to lead kids in meaningful ways, when she gives in and does the planning herself. That Laurel president wanted to get out of a planning meeting so she offered up a slip-shod idea that I “paid” for for a long time with those girls because I wasn’t about to say to the group, “Oh yeah? This ‘dumb’ idea was hers!” LDS leaders have different pressures than youth leaders outside the faith. Kid-run is the ideal, but because these activities carry the burden of representing obedience to God, kids have something to resist. An activity should be an activity and not anything more. It is a huge challenge to provide just enough leadership to the young women that they feel ownership of the program, but enough guidance that activities don’t flop. I think I would have diplomatically pointed out that it was the Laurel President’s idea and used it as a learning experience for all involved. But, it’s water long passed under the bridge. I read this post and the one at fMh that concentrate on funds and effort spent on YM/scouts. I, too, live outside the intermountain west. Our scout program is very hit or miss. But our ward budget for the youth has always been on a per capita basis. In that sense, it is fair. I don’t see the budget making that big a difference in strengthening testimonies and moral resolve in our youth. It is much more the function of home life. And, youth leaders are very often the parents of the youth. You would think parents would have a self interest in having a good program, but unfortunately, sometimes it just isn’t so. To be clear, I was diplomatic with the girl. And she was very in my face. She wasn’t exactly the ideal Laurel president, so I had to stop her abuse in its tracks by throwing her own words back in her face. It was entirely private. No one heard. Just the unfortunate reality of the situation. The bishop called her to the position without any input from me. He rejected the name I’d submitted for the position and I’ve long thought it because he had issues with the style of that girl’s family. Funding needs to be more fair. In my ward, those many years ago, it most definitely was not equal. More and more wards are catching up. My present ward, for instance, has allowed the girls to get in on the Boy Scout fundraiser involving the placement of flags on national holidays. That has the potential to bring in a lot more money than the garage sale they were confined to have to raise funds for camp. You’re so right about the callings issue–callings certainly bring many into scouting who develop a genuine love for it, but more often I think it ends up meaning the adults aren’t willing or aren’t capable of the effort required even if they generally mean well. It also doesn’t help that callings change so often–building a great youth program takes years of dedication. Ironically, guidance from the general authorities is that youth leaders should enjoy long tenures, but the reality is very different. We have new YM and YW presidencies on an almost yearly basis, which results in zero momentum. We also underestimate the difficulties caused by automatically enrolling all the youth in the program’s rather than having them populated by kids with some sort of interest (in anything…). The scout program is certainly equipped to deal with this (since the range of activities is so wide), but not when understaffed and under resourced. I am active and love the LDS church. I HATE the partnership of church and scouts that turns scouting into a “Calling” , and creates HUGE budget and time inequalities for girls and boys. Many feel as you do. I have a friend with a daughter who wanted to have a pinewood derby, but the local leaders weren’t interested in that for whatever reason. So this mom hunted down a track on her own and is running a derby for whatever kids want to participate, regardless of gender or church membership. Gotta love her.